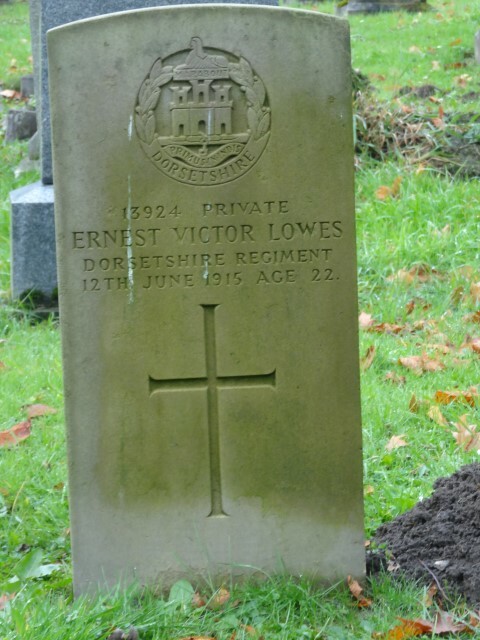 13924 Private Ernest Victor Lowes, 3rd Battalion, the Dorsetshire Regiment died 12 June 1915 and is buried in Lynesack (St. John) Cemetery. He was 22 years old and is commemorated on the Copley and Woodland War Memorials and the memorial plaque in St. John the Evangelist Church, Lynesack. Much sympathy was extended to Mr. and Mrs. John Lowes and family of Copley in their bereavement through the tragic accident of their son, Ernest who was accidentally drowned whilst bathing at Weymouth, Dorsetshire. Deceased, who was only 22 years of age enlisted in Kitchener’s army at the outbreak of war and was in training at Weymouth when the accident happened. Deceased body was conveyed home for burial and the funeral took place on Wednesday week at St. John’s Church, Lynesack. Private E.V. Lowes died 12 June 1915 and was buried 16 June 1916 at Lynesack Cemetery, the funeral being conducted by Rev. D. Marsh.